A new book attempts to explain to the non-specialist the seven most important unsolved problems in mathematics. A million dollar prize - put forward by a US organisation - awaits the individual who can solve any of the so-called Millennium Problems. The updated paperback - also called The Millennium Problems - is written by Keith Devlin, executive director of the Centre for the Study of Language and Information at Stanford University. "It was an enormous challenge for me in writing the book," Dr Devlin told BBC World Service's Outlook programme. "I had to write a book that could tell you what the problems were - go around the problems without getting into them. "I describe those seven problems as the Mount Everest of mathematics. "There are several books that you can buy about mountain climbing that are great spectator books, that give you a sense of what it's like to climb Mount Everest without getting people right down in the dirty details of how you do it." 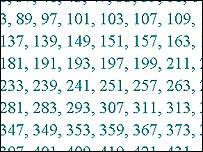 An original set of 23 mathematical problems was outlined by Prussian mathematician David Hilbert in 1900. By 2000, only three of these remained to be solved, although a Swedish student Elin Oxenhielm claimed recently to have partially solved one of them. Her solution was later withdrawn. One that does remain - and is the first that Dr Devlin's book outlines - is the famous Riemann hypothesis. "I put the Riemann hypothesis first in the book partly because many mathematicians regard it as the most important unsolved problem in mathematics," he said. "Secondly, because although the problem itself is not easy to explain, you can really get it through something that's much easier - namely prime numbers." Prime numbers are those which are not divisible by any whole number apart from themselves and 1. "The most interesting thing about them perhaps is that they seem to be random - they crop up in what looks like a haphazard fashion," Dr Devlin added. "If you start looking at numbers, at first you find quite a few of them - 2, 3, 5, 7, 11, 13, 17, 19 - they seem quite common. But as you keep on climbing through the numbers, they seem less and less common." The Riemann hypothesis is about the frequency and pattern of these numbers. "You can view the prime numbers as mountain tops, or points on a map," Dr Devlin said. "[Riemann] showed how the pattern of the primes, the way they thin out, relates to the points where the landscape goes down to sea level." Although the problems primarily mean little to non-mathematicians, they do have important practical use. "There are weird analogies between this very pure-sounding mathematical problem and some very deep and beautiful problems in physics," said Professor Sir Michael Berry, of Bristol University, UK, and a physicist who has worked on the Riemann hypothesis for 20 years. "[It's] to do with chaos - the randomness that's in the primes - and quantum mechanics." He added that, for example, the CD player was a machine that worked because it was based on quantum mechanical understanding. "But that's not really what the mathematicians are interested in," he said. "Prime numbers are the atoms of arithmetic. You know that you can make up any number by multiplying primes together... they really are bedrock objects in mathematics. "That's the reason for the obsession with them. Anything you can find out about their arrangement - which is what the Riemann hypothesis asserts something very deep about - is of great interest to mathematicians." Dr Devlin said the reason mathematicians were so interested in the problems was their "inner beauty". "You've got to like a challenge, you've got to really resound to be challenged to do things... you get your adrenaline rush from working hard and hopefully solving a very difficult problem," he stated. "When you solve it, you get this sense of the inner structure that's been discovered."